In this age of digital music, it’s no longer necessary for mobile DJ’s to carry records and turntables to events; just about all that is needed today is a laptop computer and a media controller. Yet, too many DJs are still hiding away in cavernous consoles that were originally intended to house bulkier gear. Global Truss doesn’t think this makes much sense, which is why the company has come out with a sleek digital DJ stand, designed to hold laptops, digital workstations and the other high tech gear used by many DJs today. The new Global Truss GT-Digital DJ Stand projects a sleek, modern and professional look that reflects positively upon the DJ and allows him or her to step out from behind the console and get closer to audiences. The heavy-duty Digital DJ Stand is sturdy and secure enough for mixers, workstations and laptops, yet is lightweight and compact, allowing it to be easily transported between events. 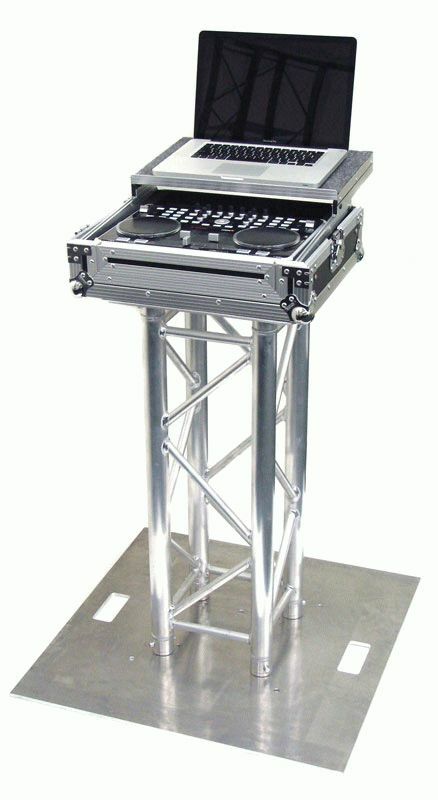 And because of the Digital DJ Stand’s compact size, the DJ can be an active participant in the festivities, rather than separated from the crowd by a booth or heavy console.